Whoa. Whoa. Okay, that HAS to be the most peculiar pair of lovers ever to pack their house with bagpipe chanters, Arabic flash cards, Chinese literature and children's drawings. EVER. Amanda Bennett's memoir of her husband Terence's battle with cancer is also a memoir of one of the most eccentric couples I've ever encountered, in memoir OR fiction. There were times when I was literally gaping at the page, thinking, "How old are you? Two?" as I read about their name-calling, sulking, yelling and silly fussing about minuscule differences. But there is a vein of deeply tender love that illumines every page and puts the reader squarely in the corner of Amanda and her brilliant, childish, maddening, fascinating husband Terence. I ate this one up.But I would say the title is somewhat misleading. I have some feelings about end-of-life care and the wickedly expensive tortures that the Western medical establishment sometimes puts families through in pursuit of another week, another day, another hour with their loved ones. So I really did expect this to be less of a memoir and more of an examination of the costs and benefits of end-of-life care. And it wasn't really that at all; the costs are tallied, but there is no real analysis of why and how we make the decisions we do, and if there is a better way to do it. But that's okay, Amanda! I totally forgive you! I love a memoir, and this is the best I've read in ages.Thanks to LibraryThing's Early Reviewer program for my copy of this excellent memoir. Not that most can't see the foibles in the healthcare system, and not that there weren't many who saw stories like this coming in `those early days' when automation was first being touted, but this incredible memoir provides an up close personal look at what's happening in an inexplicable decentralized health system.This is what I really enjoyed about Amanda's memoir; her style of storytelling... short clipped sentences, and the way she allows readers to ask and then answer their own questions about our healthcare system. Almost, but never really does she seem to want to blame anyone. Instead, through careful research she struggles to make sense of what happened by detailing the many disjointed facets that went into treating her husband's illness.There is just so much to comment on. I was just as much swayed by Amanda (and Terence's) quite enchanting and (often) peevish courtship and romance. Gosh, I just loved how they met. Hilarious! After finishing the book I even did a little research of my own and found a beautiful portrait of the family. I needed to see that picture. It very much supported what I read; Amanda's durable perseverance, and Terence's great big personality, and how together, through their love of family and respect for life endured this challenging time. This memoir, written by Amanda Bennett, is both compelling and moving on a personal level and also on a societal level. Ms. Bennett starts this story.. a story about her life with her husband, Terence Foley.. how they met, their life together and his battle with kidney cancer in 2007, and the lengths they went to in hopes of saving his life.Ms. Bennett starts her narrative by writing about her time as a correspondent in China.. a country which in 1983, was nothing like it is today. Ms. Bennett describes the China of 1983 as a cold and desolate place. The only bright spot of her time there was meeting her future husband, Terence. Their relationship, which she describes as tumultuous, eventually culminated in the two marrying in 1987.In the first half of the book, Ms. Bennett writes about things many people can relate to.. the every day moments, which when put together , make up a life, a marriage, a family. She writes of job opportunities and the frequent moves around the country that those opportunities require. she writes of the birth of a child and the adoption of another. She writes of holidays, birthdays and school activities. And among all of the minutiae of their lives, she writes of the day that Terence was diagnosed with kidney cancer. She looks back on that time and in the second half of the book, she writes about the whirlwind that their lives became after her husband's diagnosis. She writes about the endless stream of oncologists, the hospitals, the tests and the treatments. This memoir isn't JUST about Amanda Bennett, Terence Foley and their family. It is also about the complicated health care system in the United States and despite all of the lifesaving treatments and pharmaceuticals available, the system that people rely on when tragedy or illness strikes is complex and even seems to be badly broken. After her husband's death,Ms. bennett and an assistant took the time to study the stacks of bills and statements from insurance companies that had been sent. What Ms. Bennett realized was that, in the stress of dealing with the needs of her family and trying to cope with her husband's illness, she had not been able to take the time to really look at these bills and statements and consequently had no idea just how much her husband's care had cost. She became aware that, even if she had been able to study them when they were received, much of what was presented did not make sense. The statements were written in terms she did not understand about procedures and tests she sometimes knew nothing about. And because she had had a number of job changes and the family had moved a number of times, she could clearly see that what a person was charged for the same test or procedure varied from hospital to hospital. And the amount covered by insurance companies for the same procedures varied from one company to another. The only thing she knew for sure was that when a bill came in the mail, she paid it... without really studying it to see what they were being charged for? And who could blame her? A final tally of all charges for Terence's cancer came to $618, 616.. two thirds of which were charges for the last two years of his life. What Ms. Bennett realized was that her family and her employer had spent hundreds of thousands of dollars on treatments that she was not even sure were effective ; but at the time, she and Terence wanted to 'buy' him time to continue his life.. their life together. She admits that they were very lucky in that they possessed very good insurance; but she questioned.. what happened to people who did not have good insurance or any insurance at all... a fair and thought provoking question. Ms. Bennett has not only written a poignant memoir about her life with her husband and his battle with cancer. She has also posed a very difficult question... just what IS the cost of hope and ultimately, are the outcomes worth the cost? I was hesitant to read this book just because of the subject matter, another story about someone dying of a terrible disease. There seems to be a huge tidal wave of these books lately and although most are written to be inspiring and hopeful, they can really wear on you. This book is also about this woman's experience with her husbands terminal cancer. Having lost my mother in law a few years ago to lung cancer I was afraid to bring up some very sad feelings. But what intrigued me about this particular book was the concept. Yes, it is about a wife and her experience dealing with her husband's illness but she took a new angle on it. She chose to review the experience and go back and talk to the doctors about the choices that they made and also about the cost, monetarally, physically and emotionally. I found this authors writing style very to the point. She doesn't spend time describing things, instead she gets right to the point page after page. Her sentences are short and crisp. I think that this comes from the fact that her background is as a newpaper editor. Her relationship with her husband was facinating too. This was no typical love story, This was two people who loved and respected each other working their way through building a life and a family together. I would have loved to have met Terence! I admired the way that Amanda obviously didn't want anyone to feel sorry for her or her family. She wanted to investigate and in her case, appreciate the world of doctors, medical care and health insurance. As we all know this is a red hot topic right now. When Amanda begins to review the bills, treatments, options, etc for cancer you as the reader quickly realize what a tangeld web it is. In some ways it seems ridiculous and can make you very angry. But this isn't an attack on the system, it is simply a revision of the choices made during a very difficult time when all you can do is listen to different opinions and options and then guess. And that is where hope comes in! No one will ever know if the choices made were ultimately right or wrong but Amanda is not juding herself or anyone else she is just writing about surviving and respecting her husbands decisions and the way he made them. Thank you Amanda for sharing this story and Terence with us (and respecting your children's privacy). I thorolughly enjoyed this book and finished it in just 2 days. Could not put it down - at so many levels! Eminently readable, engrossing memoir written in easy journalistic prose by an eminent Pulitzer prize winning journalist who also manages to make a bold statement about what's gone terribly wrong with our Kafka-esque healthcare system. At one level this book is a beautiful love story that will bring tears whether or not you've lost a loved one to cancer. At another level it's the story of a life well lived with every chapter unfolding and decades flying by reminding the reader to pay greater attention. She manages to capture detail and mood at every turn artfully. But the book is much more than just that. It's really a book that questions the decisions we make and how we make them when we weigh love and hope against probability and cost in hard dollars in a ridiculous system where the cost is not even fully visible to those claiming or consuming it. "The Cost of Hope" brings to light some of the difficult questions we are all likely to face at some point. However the crux of this work lies in Amanda Bennet's gifted investigative journalism into where and why costs of healthcare lie, what creates them and why they are runaway as they are. The greatest irony - not lost on her - is that while she fought to save her husband's life neither she nor any of the caregivers had any idea what the costs were or who was paying for them. It is only after the fact that she goes in to investigate what actually transpired and finds out how completely broken the system is. Since over 80% of people like her get their health insurance through their employer they never really see or bear the true cost of their healthcare. Hospitals, doctors, other caregivers don't have to compete too hard since pricing is hidden and so there is no market pricing at any given time for any health good or service. Providers all charge whatever they like (this is not an exaggeration) and insanely enough the insurance companies pay what they feel should be the right price; and this too varies wildly by healthcare provider AND by insurance company. Since most patients never have to bear the true costs, nor do they have much choice in the insurance company they pick, there is virtually no shopping around for health care providers or health insurance coverage (and the market for that remains insanely limited). Amanda Bennet finds is that while the economics are predictably unsustainable even more tragically this results in perverted incentives. None of the doctors, hospitals, etc are geared for the benefit of the patient since the patient is neither the customer, nor the shopper, nor the payor. And that of course results in creating a bizarre system where everyone may mean well but no one is responsible and everyone is simply "doing his job" responding rationally to a rotten incentive structure. Amanda Bennet does not go into solutions (which is a whole other story) but she is a rare one for the honesty and insight with which she illuminates what has gone so terribly wrong in our healthcare system. I recommend this book highly. It is thoroughly engrossing even as a love story of two highly intelligent, complex persons, and as a riveting memoir. This book was an excellent personal narrative that illustrates everything that is wrong with our health care system. The author, Amanda Bennett, a Wall Street Journal and journalism veteran, tells of the struggle that she and her husband waged for seven years against the deadly cancer that ultimately did killed him (no need for spoiler alert----you know this from the get-go). The titlle is taken, not just from the incredible financial cost ( and waste) caused by our seriously screwed up, convuluted delivery of care, but about the emotional toll it takes. As someone watching this happen right now with one of my dearest friends, I can testify to the utter truth of the case she is making. When someone is diagnosed with a disease such as this it is much more like a detective story (without a investigator in charge). Confusion, contradiction and inconsistency reign. It is like listening to a group of brilliant musicians drown each other out because there is no orchestra leader. Hubris in the medical community is part of this issue. Doctors will very seldom say---"I just don't know.". So, unnnecxesy tests are given at a bizarre range or costs (over 75 CT scans were given to her husband ranging from a cost of something like $350 to $5000). It is all based on BIG INSURANCE and what they will pay or won't. Whatever you think about the health care issue raging in our nation, surely we can all agree that something is broken when there is that kind of price fluctuation on one simple procedure. But the book is also a wonderful story of a marriage----with all its ups and downs, highs and lows. In the end, I can't imagine trying to navigate the process of care for a devastating illness without a significant other at my side as an advocate and partner. My friend is a gay man who did not have a partner when he became sick. He has a boyfriend, sisters, a brother and friends like me who love him dearly. But all of us have our own lives. This is the case for millions of Americans who will suffer far different "costs" as they face American health care alone. When Pulitzer Prize winning journalist and news editor Amanda Bennett learned her husband had cancer, she promised him that she would fight for his life and never give up. In The Cost of Hope she recounts exactly what the fight cost in human and financial terms. along the way, the reader learns a good deal about health care and some of the reasons that costs are spiraling out of control. Bennett also asks searching questions about cancer treatment, drug studies that amount to "throwing the spaghetti against the wall to see what sticks" and whether the system helps or hurts sufferers. She wonders how families without her employer's excellent health insurance can even survive. She quantifies costs, compares them across hospitals and insurance companies and shows how difficult it is to make sensible cost decisions with minimal information. The thread that binds this book together is Bennett's moving portrait of a family coping with long term medical crises over a period of years. So this is also a beautiful book about a young couple who fall in love in Beijing and raise a young family wherever her new jobs take them. We know the ending at the outset, which makes the chapters more poignant. I highly recommend it to anyone interested in understanding why US health care is among the most expensive in the world with results that are markedly worse. The Cost of Hope: The Story of a marriage, a Family and the Quest for Life turned out to be more a portrait of love and marriage than I thought it would be. I think I was expecting a commentary on health care, its cost and when we go too far to save someone, even those we love. It was this but so much more. It is a very poignant story about an ordinary couple facing illness and decisions that many of us make. As we are able to prolong or extend life and I face my own aging and that of those around me, these end-of-life issues come to the forefront.Even knowing the outcome does not quite prepare you for the journey. Reading about their first meeting, you’ve got to wonder how Amanda Bennett and Terence Bryan Foley ever got together but you root for them. Their differences were more than just age but somehow they managed to love, laugh and live quite a life together. I laughed, I cried, I thought.I’m not certain I’m any closer to knowing when it’s time to give up, either for myself or those I love, but I definitely was touched reading this book. I applaud Amanda Bennett for writing this and sharing her experiences with us. In disclosure, I worked for Amanda when she was editor of the Lexington Herald-Leader, and I admire her greatly. I met Terence several times socially.Even if I had never met them, I would have felt like I knew them intimately by the end of this book, thanks to the detailed and perceptive moments. Amanda paints such a real portrait of their lives that it's completely understandable why the cost of hope, as she puts it, seems wholly reasonable. It's true: we shop carefully in other aspects of life, but we don't think about the cost of health care in a crisis. We are focused on living.The book excels at probing and reporting on our health care system, while never losing sight of the human core.It's simply a must-read. Sam gave me an autographed copy of this book after hearing the author speak in DC. Read first few chapters this morning - what an unusual and interesting relationship this couple had! 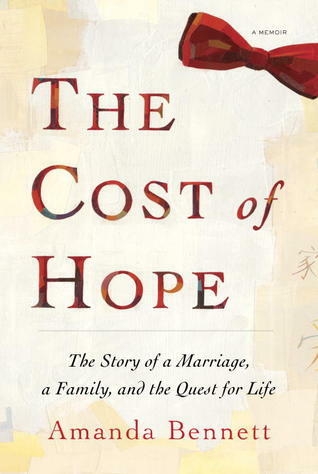 I just finished reading “The Cost of Hope” written by Amanda Bennett. I requested it as an Advanced Reader’s Copy through Librarything.com many months ago because at the time I was researching our health care system and trying to see what changes might make it more effective. Since the novel was about the author’s experience of her husband’s illness and death, and since the author was a newspaper journalist, I expected it to be filled with data.Then, for the longest time, I allowed the book to linger on my book shelf, reluctant to pick it up and get into the material. Maybe it was because I had just experienced the death of my mother and was no eager to revisit my emotions. Maybe it was because I wanted to get lost in a story, not data. So, when I finally did open the book, I was unprepared for what awaited me.I found “The Cost of Hope” to be more of a personal memoir than a research text. It is the story of Amanda and Terrence…husband and wife, lovers, sparring partners, who met while both were working in China 1983. They are an unlikely couple. Rather than walking through life in step together, they seem to remind me of two spirited dogs each on their own leash, pulling in different directions while a dog walker tries to navigate them down a path. They fall in love, or at least realize that they want to spend their lives together, and embark on a journey that takes them to various locations, jobs, homes, vocations and avocations, all the time supporting each other and also constantly bumping into each other.Terence becomes ill. It is the dreaded C word and their lives start down a new path. As their personal story continues, interjected into the narrative are the details of their experiences with various doctors, interventions and treatments, the confusion and the quest of trying to beat this demon that has invaded their life. The book presents a cast of innumerable characters who are, each in their own sometimes bumbling way, just trying to solve a dilemma. I came to realize that no ONE has the right answer. There is a good deal of chance in the system. Hidden characters in the plot, read test results, put forth suggestions and on the basis of who reads or acknowledges what, a path is taken.The title, “The COST of Hope,” lead me to think it was going to talk about the monetary expense that is so huge and so hidden from the patient…and the book does that. But more than that, it talks about the other “costs” of hope. The cost that is extracted from all those who participate in the journey…the patient, the family members, the medical personnel…the intangible cost of continuing to seek and believe that good news and relief is just around the corner.In the end, I was left with the belief that, while the financial cost is surely something to be questioned and looked at, the intangible cost may well be worth it. It is the clinging to this HOPE that continues to give meaning and direction to their lives, that motivates them to face each day with an energy to continue to participate in life. And that is the main message I was left with. I appreciated most the last chapter recounting Terrence’s death. Not morbid but very realistic, it recalled to me my own experience of being with my mother through this process and the writing gave it dignity. Then the ending “Afterword” left me with an appreciation for the flow of life and the humanity of the people who in their own feeble and often bumbling way hold the entire medical system together. Does it all COST too much, in the financial sense? Yes. Does the billing process not make sense? Yes. Is there a great deal of chance in the system? Yes. Is medical care more accessible to some over others? Yes. Do all the actors in this drama have their own agendas? Yes. And yet, in spite of all of this, somehow the human spirit triumphs. And in the end, I was left with a sense of HOPE. Amanda Bennett looked into the cost of her husband's treatment for incurable kidney cancer (he had a particular resilient kind, although different pathologists disagreed at different points about what that was). After Terry died, Bennett was able to pull medical records from different treatments and even the same scan that was covered by two different insurance companies to see what the hospital was reimbursed (amount varied from 20% to 80%, and b/c someone else's medical info. got in there, she was able to see what someone who paid out of pocket also paid, yet another amount). What she wonders is would they have done things differently if they knew how much it cost to keep Terry alive, if, as consumers, they knew what the bills added up to (some half a million dollars). For me the book works best when it points to the ways that health care costs vary according to who the insurer is and who is communicating with who. Were Terry's 76 MRIs in 7 years necessary? No, but unless a Dr. has another MRI to look at, there will be an additional test. The other issue that came up for me in reading this book is that both Terry and Amanda were in denial about the outcome (death), and no one spoke to them about hospice until a specialist they went to about Terry's coughing (cancer was in his lungs) suggested it b/c Terry was too tired to sit upright on the examining table (Terry was admitted to the hospital then). Prior to that, Amanda thought he just needed stronger versions of cough medicine and was planning a work-related trip to Dubia. At that point, Terry was so sick that it would have been difficult to have the hospice conversation.What I wonder though, is if having a hospice conversation earlier would have been helpful to everyone involved, and if there was some coordination of care, if this could have been done by a patient advocate or similar? Bennett mentions some of this b/c Terry's care, as in most cases, cost the most during the last year of his life and particularly during his time in the ICU. It really indicates how our national obsession with staying alive, regardless of cost, would benefit from a conversation about what a good death looks like and how to create a space for it. What neither Amanda or Terry knew would be the signs of when someone might consider hospice rather than additional treatment. While I admire Terry's willingness to participate in drug trials (and he participated in one that is approved and used in the treatment of cancer like his), it would be great if we could find a way to balance treatments that help people live longer with guidance about how to die well. This memoir is the superbly written story of Amanda Bennett and her husband Terence Foley from the time they met in Peking (correct spelling at the time), China until Terence's death more than 20 years later from cancer. It is also the story of how she went back through all the records with a colleague after Terence died, trying to figure out what happened and what it all cost, while she was either in denial or in a blur as they tried desperately to buy him more time. Given the topic, this could be extremely sad and painful to read, but she includes wonderful descriptions of the China they knew, the U.S. cities they lived in, Terence's quirky habits and hilarious ways, their delight in their children, and her career as a reporter then newspaper editor. As a result, the book isn't at all depressing. I was moved by the way she told about his life and his death; she loved him so much.I loved their personal story, but I think the account of his medical history and its costs should be required reading for politicians who have the power to do something about our health care system. (Party politics be damned for a change.) Bennett had four different insurance companies during the time her husband was ill when she was selected for ever better editorial positions in different parts of the country. At the end she was the editor of The Philadelphia Inquirer, which oddly enough was dying at the same time that her husband was dying. She was grateful that she always had good health coverage. That saved her from worrying about confusing invoices at the same time her husband was going through pharmaceutical studies for new medications and having countless tests. Afterward, for six months she and her colleague tried to make sense of all the paperwork. She traveled across the country talking to the different doctors they had seen, and tried to figure out who all those doctors and labs and other entities were that had billed her insurance company too. Her conclusions are well worth reading; she's a journalist after all and researched this just as she would any other important story. There was a personal question to answer as well - had she pushed him too hard to try to live? Was that an additional burden she put on him?I was engrossed in this book from page one to the end. I greatly admire her strength, her adaptability in the face of countless problems that would flatten many people, and her journalistic abilities. I'm very glad she wrote this book and hope it will reach people all across this country. The Cost of Hope by Amanda Bennett is definitely a love story. Amanda raises the question of whether or not it is worth it to pay so much to keep her husband alive after his deadly diagnosis. On page five, Amanda Bennett says that his medical bills totaled $618,616 from the day that his disease appeared to the day that he passed away, December 8, 2007. She was very fortunate to have most of that covered by insurance. She goes ahead and gives her answer to whether it was worth it for amount of time that he lived after the discovery of his kidney cancer. Of course, it was worth it. The hope of more time together with family and friends was well worth it. And that is what this book shows.Amanda Bennett and Terence Bryan Foley met in Peking (before it became Beijing) in 1983. I enjoyed her description of Beijing in 1983, I had been there in 1992 and a lot had changed in just nine years. The couple seemed to be total opposites. Their backgrounds, families and ideas were so different. It is amazing that with all the friction between the two that they were able to stay together. Their frequent quarrels during their courtship and marriage worked out to be just another way of their loving each other.Her husband was very unusual, he knew Japanese, Chinese, Spanish, and some other language, he dresses carefully, wore a bow tie, saved everything, played many musical instruments, flew a planes, learned so quickly. Reading about him, I am positive that he was incredibly intelligent and also very infuriating at the same time. He could invent himself in order to get a job or to impress a date. If this book had not been written many people would not have known this man at all.This book went incredibly fast for me. The subject of her husband was so fascinating that I could not stop reading. Just like all cancers are not alike, not all kidney cancer develops the same way. I don’t think you will be able to lay this book down.I recommend to everyone who is interested in love or medicine.I received this book as a win from GoodReads and that in no way influenced my review. Wow - I have very mixed feelings about this book, but in general found it very interesting. I, too, have a spouse fighting an incurable cancer. The feelings she brought up resonated with me, and made me realize there are others out there who do, or have, felt like me. What I had a hard time dealing with was her thoughts of the costs. I have, out of curiosity, analyzed our bills. And when we sought treatment out of network, I learned first-hand how the patient without insurance is the one that really bears the burden. However, I have never thought that you can put a price on the human life or hope. My husband's treatments have not yet negatively impacted his quality of life to make us question their worth. But Amanda Bennet did not adequately make me feel that (aside from the IL2 treatments) the effects from treatment outweighed the benefits derived.Also, the author makes it clear that this story is NOT her children's story. Without that (yet I completely understand this decision), one cannot truly weigh all the costs/benefits. I have four kids, and every single day that they create a memory with their dad is worth every single penny spent to have that day. Every single penny spent on an MRI that says "stable" is worth it - because that is a night we all go to sleep with a smile on our face and a prayer of thanks. Hope is, quite honestly, the one thing that keeps me going. Once I am forced to give up hope..... wow. I can't even finish that sentence. My ability to do what I need to do for this family - both my husband and my kids - is fueled by hope. It's what allows me to get out of bed, lift my head up, and get through a day without falling apart. I have no idea what it's worth. It's clearly different to me and my kids than it is to anyone else not in our situation. This book may ask some questions, but it can in no way answer any of them. And what the author fails to address is how would the lives of her husband, her children and herself been different in that seven year battle without hope. I give this book four stars because it is well-written and because its message about the cost of health care and the ways in which both doctors and patients are insulated from those costs is a critical one. Although this message is a bit buried at the end of the book, Bennett makes her point clearly. Years ago when health care was first presented as a "market commodity" (this was in the early 1980's) I was involved in health-planning on a local and state level. It seemed pretty clear to me that most of us will not shop around for the cheapest CT scan or MRI -- and in fact, that were we to find one that is cheaper, we would be likely to opt for a more expensive one, reasoning that it must be better somehow. The end result of none of us paying directly for health care (or those of us who do paying a way different price than those who are paid for by the government) has been the out-of-control increase in health care costs. As Bennett points out, it is nearly impossible to find out what any give procedure actually does cost. All of this became very important to me in 2000 when I began nearly 8 years of chemotherapy and other procedures for breast cancer that kept recurring. My bias in loving this book is clear by now, I'm sure. I will say, however, that I simply enjoyed the story and getting a sense not only of this remarkable couple but also of China in the 70's and 80's. This was an interesting story of how two people met, had a family and then handled the tragedy of the husband's cancer and eventual death. I like the way she writes. I'm not sure why the author is so fascinated by the cost of medical procedures. She and her husband move a lot so she is able to compare costs for the same procedure at many different hospitals. They also change insurance companies about 4 times so she compares the coverage and billing percentages. She seems surprised by capitalism and the free market economy and that businesses make the MRI machines and manufacture drugs. Her interviews with the doctors after her husband's death are a unique way to analyze care in hindsight. She really wanted to rethink everything that happened. The process of analyzing everything that had occurred seems to have had therapeutic value for her. She is an admirable writer to go through what she did and to get it all down on paper. This book looks through a strong lens at how and why we care for adults with life threatening illnesses. The love story between the author and her husband gave the real bones to the book and all the details were built around that relationship. It was great to read at the end that she was able to remarry and enjoy life after all she and her young children went through over the years. What a unique book. It was a memoir of a marriage, AND a commentary on the current state of the U.S. healthcare system, from the viewpoint of this married couple. The husband dies of cancer after 7 years of being ill with it, and the wife (the author) goes into detail about why do some procedures cost what they do, why do some doctors and labs get involved when they do, and thoughts about the choices we make, given the risks and costs.Her main point about the costs is how hidden everything is. If you are lucky enough to have good health insurance, all kinds of magic mumbo-jumbo happens behind-the-scenes between your insurance company and the medical provider. A lot of it is similar to some crazy bazaar where buyers and sellers negotiate all kinds of crazy prices for things. She surveyed the 76 CAT scans her husband received in the 7 years, and they ranged in price wildly--from a few hundred dollars to many thousands. Why the variance? Nobody knows.So those medical/insurance issues were really fascinating (and scary) but the story of the marriage really made this book compelling. If it had JUST contained info about insurance, that obviously would have been dry and boring, so interspersing it within the story of the marriage made it a really good read. I think I finished it in just a couple days. I won this book for free through Goodreads First Reads. At first I was thrown off by the title, but it is actually quite literal in the sense that it means the cost of the healthcare that gives one the hope of survival.I was pleasantly surprised by this book. It tells the story of the author's life with her husband as they meet, start a family, and try to lead normal lives as they fight against cancer. Their story is filled with love, pain, and hope. It is beautifully written, with a lovely balance between humor and seriousness, and between "normal" life and life in hospitals/doctors offices/treatment.This book also gives insight to the healthcare industry and the cost of care. She adds in research done on the healthcare her husband received, including records and interviews with the doctors involved. She states actual costs, and compares costs of the same procedures throughout different insurance companies (that they had) and locations (places they lived). She speaks of how they never knew of the costs until after her husbands death, when she finally looked at the bills, and saw how outrageous the costs are (the total of his care totaled over $600,000). She touches on the idea that many people can not afford the healthcare that would give them a chance to continue living. It is definitely a real eye opener. I had he honor of meeting Amanda Bennett last night at a book talk in North Carolina. She was both brilliant and charming. Her book is a wonderful blending of investigative journalism combined with a love story. For the first time, I loved reading about a topic (health care) that usually makes my eyes blurry. Her quirky husband Terrence pushed her to reach her potential through his confidence in her and his adventurous, loving spirit. Together they bought him 7 years of experiences after he was diagnosed with kidney cancer. Many of their children's milestones were celebrated through aggressive medication protocols and clinical trials. their top rung health insurance paid the costs and these costs were never analyzed until after his death and this inves titration. Some of what was uncovered is definitely food for thought.Also interesting to me was how it's so hard to recognize the end of life signs when the patient is someone you love. Often doctors get so caught up in their clinical trials that they too forget to look for clues/warn families that the end is near. Thus a chance for closure/goodbyes is sacrificed. There are indeed both emotional and financial costs to our society as a whole and us as individuals. I really enjoyed this book and it made me give some critical thought to our health care system. I found it ironic that I was reading this book when the Supreme Court upheld the Health Care Law.Amanda Bennett did a wonderful job of telling her story of how she met her husband, the mercurial relationship, and Terrence's character and personality and their journey dealing with cancer.At first I wondered why there was so much about their marriage, travels, and arguements; but this helped to understand how they both viewed the battle against cancer.I agree that this book should be require reading for legislators, doctors, health care workers, and insurance professionals. My daughter is an R.N. who works for a large insurance provider and I am going to recommend that she read this book. Amanda was thorough in her research and documentation of the 'real' dollar cost of their hope, but she also revealed the emotional cost of hope. I have selected this book for my book club. I know it will bring out quite a bit of discussion.Read this book....I guarantee that it will make you think about what you would do if in a similar situation. And it will also help you to understand why our medical costs are so out of control. I read this book to compare notes about the cost of hope based on the author's experience versus my experience. The one thing that I think that every person who is fighting cancer feels is that they want to stay alive in case there is a cure or a new, better medicine. But what is the cost to the patient - while my husband was fighting cancer, there were times when he was so sick from the treatments that it didn't seem worthwhile. But he kept fighting just in case. Now 3 years after his death, there is still no cure for his type of cancer (GBM) but there have been some advances in medicines used to treat it. Fortunately for us, my husband was willing to discuss death so we had a chance to say a final 'I love you and goodbye'. I will always treasure that. I will also treasure that we had health insurance. My husband's 1 year battle cost over $1 million. Great memoir about WSJ journalist's first encounter with husband in China through their fight against his kidney cancer. It does introduce something of the conundrum of the cost of health care, but less about "would we do that again?" than "yes, we have this health system at our access, of course we would try everything." An indictment of the wide array of costs for the same healthcare procedures comes up at the end depending on how much the hospital/insurance is able to negotiate - but doesn't get explored much. She tackles a lot - but the most touching part is the remarkable way her husband comes to life - it's a wonderful tribute to him and their family. Wonderful book, well written, .... at first I did not like the personality of the guy, but I got over that ... got to let people be individuals even though they would drive me nuts! Anyway, being in a situation with caregiving for a spouse, I was re-assured that a lot of the feelings I have are normal and shared by others. I liked the fact that this book, while nodding its head to the confusion of billing and the health care system, was more personal anecdote rather than polemic. I am reading this at the recommendation of my mother (the author), who is too computer illiterate to join Goodreads, but as she wrote a wonderful review, I thought I would post it here..."Just finished”THe Cost of Hope” read it all in one sitting and cried all day.Wish I could force people to read it.....beautiful....wish you had the time, wasted on the dull witted. "So, I'm making time. So far, she's absolutely right. Bravo Amanda and Random House! Amanda Bennett - Librarian Note: There is more than one author in the GoodReads database with this name. See this thread for more information.